BRENNAN’S Mace, Rathvilly has only gone and done it again. This is the tenth occasion on which a Mace Excellence Award has gone to the popular supermarket, a testament to the commitment of proprietor Edward Brennan and his hard-working staff. “Yes, we are delighted,” said Edward. “It’s a great achievement for us. It’s good to get it because a lot of hard work goes into it and the standard is very high,” he added. 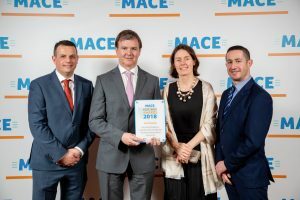 The presentation took place at the recent Mace Excellence Awards for achieving exceptional standards in retailing, which was held at the Heritage Hotel and Spa in Killenard, Co Laois. The event was hosted by BWG Foods, owners and operators of the Mace brand. The awards, held in association with the Excellence Ireland Quality Association, are only awarded to Mace stores that pass an intensive year-long inspection, including unannounced audits and visits from mystery shoppers.